The Opec+ deal to curb production to the tune of 1.2m b/d over the coming months has helped stabilise and potentially create a floor in crude oil. 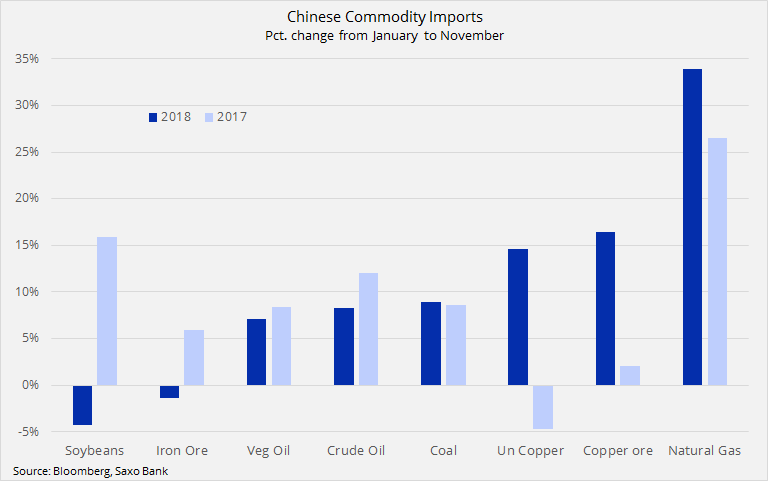 However, while the supply outlook has steadied and created some support this week, the market remains worried about the ongoing trade war between the US and China and its potential negative impact on growth and demand into 2019. Headline risks, will in other words, continue to be a key driver as we head into the low liquidity part of the year ahead of Christmas and New Year. On that basis the short-term focus in the oil market is less the US Permian Basin, Moscow and Riyadh but more Washington and Beijing. With the political influence on oil prices remaining very elevated we doubt that we will see any major new positioning before a clearer picture emerges. China’s demand for commodities have become more selective this year with natural gas seeing a continued strong rise in demand as the country step up its fight against pollution. Soybeans have been the biggest casualty of the trade war with imports showing a dramatic drop of 4% after rising by 16% during the same period last year. The rise in crude oil imports between January and November has slowed to 8.2%, the lowest annual increase in five years. In addition to the Monthly Oil Market Report from Opec at 12:00 GMT, the market will be turning its attention to the Weekly Petroleum Status Report from the US EIA today at 15:30 GMT. 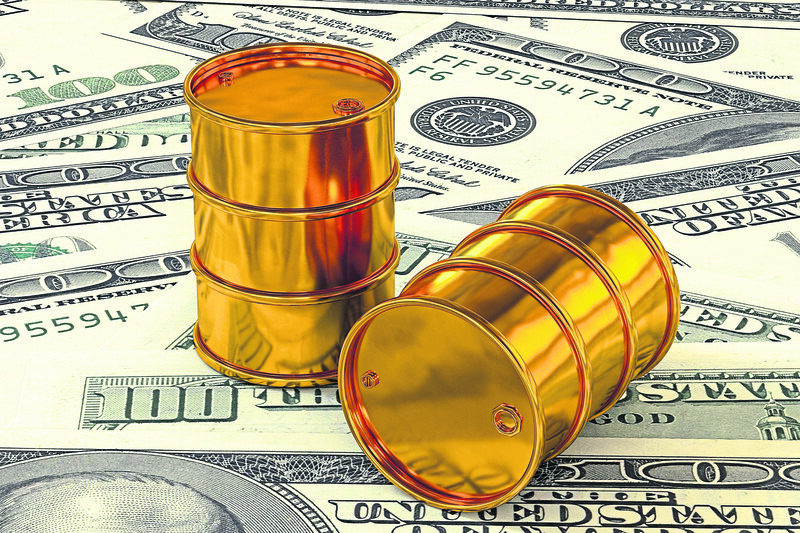 Crude oil is trading higher today after the American Petroleum Institute last night reported a 10 million barrel drop in crude oil stocks last week. Surveys ahead of the EIA report are pointing to a lower but still healthy reduction of 3.5 million barrels. This, on top of the export-led drop of 7.3 million barrels the previous week. 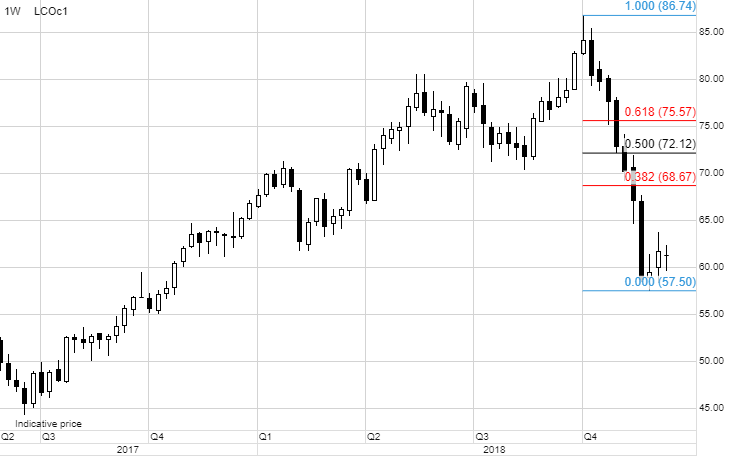 US refinery demand for crude oil has been picking up in recent weeks as the price gap between WTI and the global market represented by Brent has stayed elevated. With that we are seeing US exports of oil products hitting fresh records while the US net-import of crude oil last week slumped to multi-year low of just 4m barrels/day. 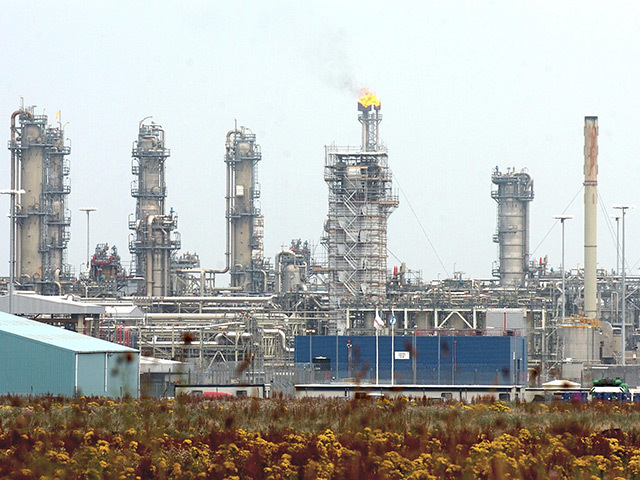 These developments triggered the first net-export of US oil and products last week. 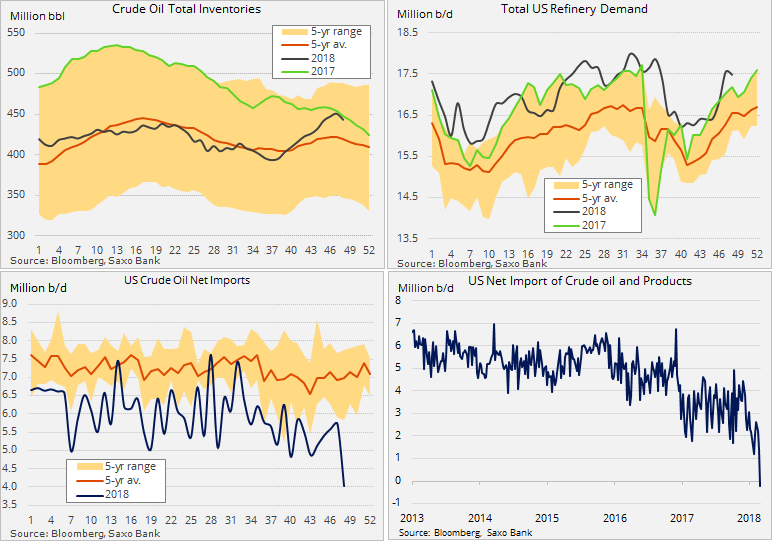 Although it’s likely to be reversed today, the trend however remains clear: record and rising US crude oil production creating a discount to Brent, which supports strong refinery demand and exports. 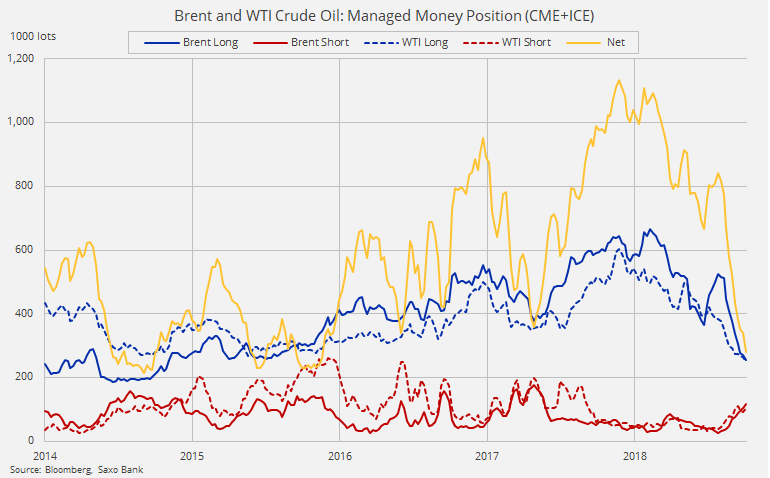 A change in the technical and/or fundamental outlook towards a more price-friendly outlook could trigger a strong buy reaction from hedge funds, which have seen a record capitulation in crude oil longs in recent months. The net-long has dropped to just 265 million barrels, a three-year low, and a level from where two strong recoveries have been seen since August 2016. However, while we still expect to see crude oil climb higher and potentially re-establish a range between $60 and $70/b the question remains if traders now will opt to postpone investment decisions until January.